It’s September! And that means it’s only a month until the Adelaide Zombie Walk. This October 11th thousands of gore splattered, groaning undead will shamble down Rundle street for a good cause, ending hunger in South Australia. Quite the fitting cause considering the common zombie’s insatiable hunger for human flesh, particularly braaiinnnsss…..! All funds raised go towards Foodbank SA who do an amazing job of helping to feed the many thousands of people in South Australia who go hungry each year. Zombie walk organisers Ann and Jason Bansemer have the mammoth task of organising and coordinating this fantastic event each year and they do an amazing job! I’ve been to most of the Zombie Walk’s in recent years and think it’s a fantastic, fun event. 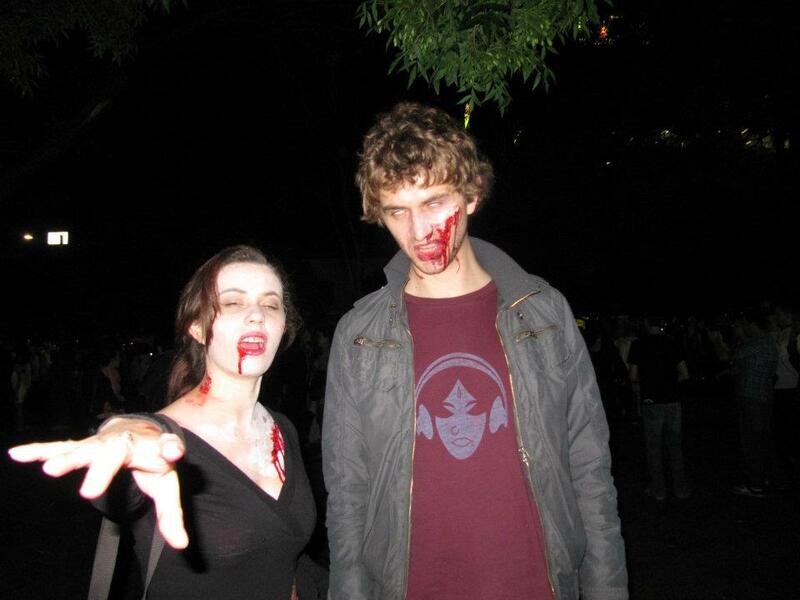 Here’s a picture from a couple years ago of me and Brodie as ‘fresh’ zombies. Creepy! 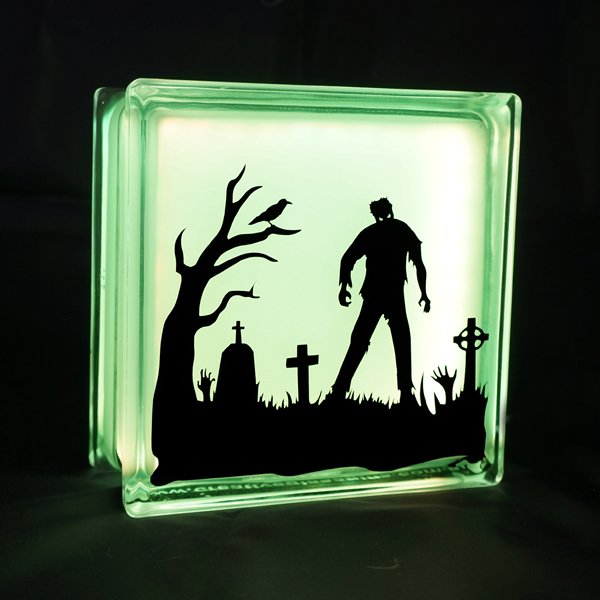 Aside from playing dead as we walk down Rundle street, this year Creative Glass Blocks is helping out by donating a super cool custom made Globlock to be awarded to the zombie that raises the most funds for Foodbank SA. One side features the Adelaide Zombie Walk logo in all it’s zombie glory, the other side is a graveyard with a rather creepy zombie glaring away. We think it’s one of our favourite custom made Globlocks to date. 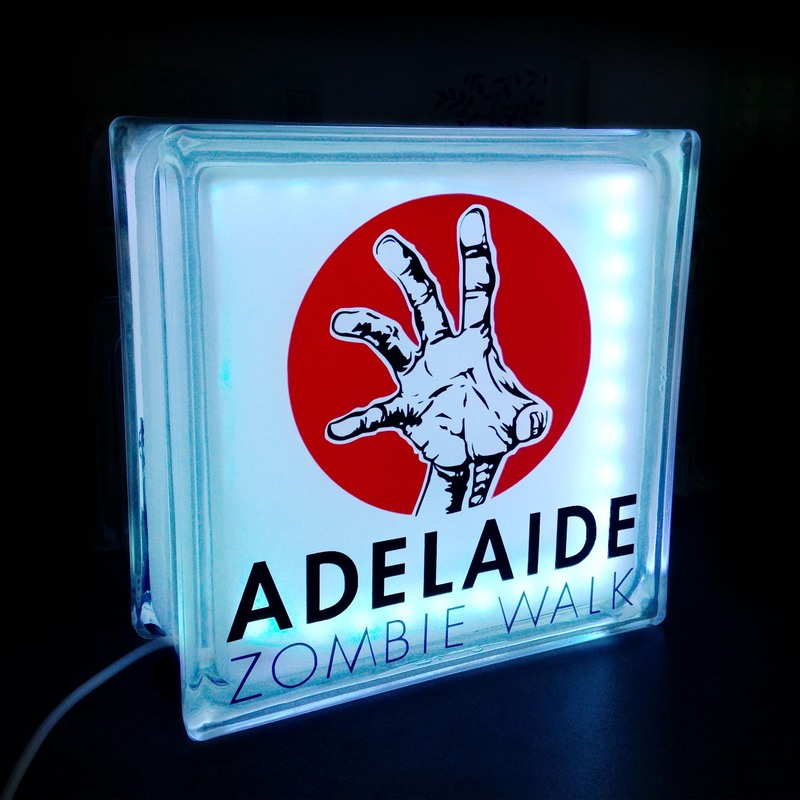 For more information on the walk, head to the Adelaide Zombie Walk webpage or to the Zombie Walk facebook event page. Also, don’t forget to check out Foodbank SA’s website to see the excellent work they do. We hope to see you at the Adelaide Zombie Walk!